But does that mean you should get a co-branded Delta credit card? The carrier certainly offers enough options (four personal and two business cards). They aren’t the most useful cards on the market due to their relatively low sign-up bonuses, poor earning potential and lack of redemption options, but they do have solid perks for the right traveler. Free checked bags, companion passes and the ability to earn elite status through spending can definitely make these cards worthwhile, depending on your travel habits and goals. Some Delta credit cards come with companion passes so you can take someone with you for just the cost of taxes and fees. That can save you hundreds of dollars a year. With the Delta Platinum and Reserve cards, you can earn Medallion Qualification Miles (MQMs) that count toward elite status. In fact, you can earn Silver status with the Reserve card without ever flying (and get pretty darn close with the Platinum card). If Delta is a carrier you use at least a few times a year, you can save a ton of money with their cards’ checked bag benefit. At $25 each way to check a bag, you’ll save $50 per roundtrip. Delta’s six co-branded cards range from a basic no-fee card, all the way up to an ultra-premium card with a $450 annual fee. As you might imagine, the benefits vary quite a bit among these cards. At the top, you’ll get free lounge access, a companion ticket, checked bags, the ability to earn Medallion Qualification Miles (MQMs) toward elite status and more. At the bottom, you’ll get a small sign-up bonus and in-flight savings, but not much else. The best Delta deal is the Platinum Delta SkyMiles card. You can get a lot out of this card if you use Delta at least a couple times a year. This card’s annual companion pass is the reason it tops my list. With the pass, you can take someone with you on a domestic flight in economy for just the cost of taxes and fees. This can easily cover the $195 annual fee and a lot more. You’ll also get a solid 35,000-mile sign-up bonus worth roughly $400, assuming a value of a little over one cent per mile. With that bonus also comes a $100 statement credit toward any Delta purchase. The standard perks, particularly free checked bags, can be valuable too, saving you $25 a bag each way. That assumes, of course, that you regularly check bags. You can earn a bonus every year you have to card too, which is an unusual perk. You’ll get 10,000 miles after spending $25,000 in a year, or a total of 20,000 miles if you spend $50,000. Those yearly bonuses include Medallion Qualification Miles (MQMs) that count toward elite status. Also an unusual card perk. You can earn up to 20,000 MQMs a year without flying, which is just 5,000 MQMs shy of Silver Medallion status. Not bad. The Top of the Line: Is It Worth It? The Delta Reserve card’s big annual fee of $450 will probably prevent most people from considering the card. Frankly, that might not be such a bad thing. If you’re looking for a premium card with lots of benefits, there are other options that are a lot more flexible. Take, for example, what you’d assume is the Delta Reserve’s top benefit: free lounge access. With this perk, you’ll get into Delta Sky Clubs for free. Unfortunately, there are a couple of catches. First, you have to be flying on Delta to get in, and second, you have to pay $29 to bring a guest with you. With the Amex Platinum card, on the other hand, you can access the Swanky Centurion Lounges and you get a Priority Pass Select membership. While you’ll have to pay for a guest to accompany you to a Centurion Lounge, you can get up two guests in for free at Priority Pass lounges. On top of that, the Platinum card also include Delta lounge access when you’re flying on Delta. It’s true that the Platinum card costs $100 more a year, but you’ll also get an annual $200 Uber credit, an annual $200 airline credit (which can cover checked bags) and 60,000 points that can be transferred to a wide variety of airlines, including Delta. However, there are still some compelling reasons to get the Delta Reserve card. It’s sign-up bonus is only 40,000 miles, but you can earn a 30,000-mile bonus every year you spend $60,000 (or 15,000 miles if you spend $30,000). If you’re a big spender, getting a yearly bonus is a great perk. Like the Platinum card, you can earn MQMs toward elite status with the Reserve card. One big difference, though, is that you can get Silver Medallion elite status just through spending. When you reach $30,000 in spending each year, you’ll receive 15,000 MQMs that count toward elite status and waive any MQD (Medallion Qualification Dollars) requirements for Silver, Gold and Platinum status. Spend a total of $60,000 in a year and earn an additional 15,000 MQMs for a total of 30,000 MQMs, which is enough for Silver status. And finally, probably the most valuable perk for the Reserve card: the ability to take a family or friend with you in first or business class for just the cost of taxes and fees. While this pass is restricted to domestic flights in the lower 48, it renews annually and can be worth thousands of dollars, particularly for those long transcontinental flights. Is It Worth Getting Delta Elite Status? While I think the annual companion passes that come with the Reserve and Platinum Delta cards can justify their annual fees, you’re probably wondering if it’s even worth trying to earn status with these cards. After all, Delta isn’t the airline it once was. In the past, the best reason to have Delta status was to get free upgrades. This happened a lot, but then Delta started offering passengers cheap upgrades to fill those seats. Now, sadly, it’s gotten harder and harder to get those upgrades to first, but you may still get into Comfort+ with some regularity. There are a few other benefits, but none as good as the upgrade. Some of your MQMs will rollover, and you’ll get free checked bags (which comes with the cards anyways), priority boarding and some hotel and car rental perks, among other things. Honestly, though, I’m not so sure it’s worth putting too much effort into earning Delta status anymore. If you’re not ready to shell out that much money in annual fees, or if you’re not sure you’ll use an annual companion pass or be able to earn elite status, the Gold Delta SkyMiles card is a reasonable alternative. The Delta Gold credit card has a relatively low annual fee of $95 (waived the first year) and includes free checked bags. If you check a bag on two round-trip flights a year, you’ll cover the annual fee. If you don’t use that benefit, you won’t get much out of this card beyond the 30,000-mile sign-up bonus (worth about $350) and the $50 Delta credit. While the Blue Delta SkyMiles credit card has no annual fee, it also lacks some fundamental perks I’d expect from any airline card. Most disappointingly, you won’t get free checked bags and the card’s sign-up bonus is just 10,000 miles. If you really want to avoid an annual fee, you’d probably be better of with a good cashback card instead. You’ll earn more and be able to use your rewards for anything. Delta also offers business versions of the Gold and Platinum cards. Their benefits and perks are nearly identical to the personal cards. If you qualify for these cards, they do offer more options for earning sign-up bonuses and few extra business discounts through the Amex Open program. Technically, you can’t earn Delta SkyMiles on non-Delta cards, but you can transfer points from American Express Membership Rewards cards and the SPG card to the Delta rewards program. While the American Express and SPG cards aren’t known for their big sign-up bonuses, they do offer a lot more flexibility. Unlike the Delta cards, you can use the points you earn on a wide variety of airlines. The Starwood Preferred Guest Amex earns the most flexible points. You can transfer them to over 30 airline and hotel partners, including Delta. If you want the flexibility of the Amex Membership Rewards program but don’t want to shell out the big annual fee, the Everyday Preferred card costs just $95 a year, comes with a 15,000-point sign-up bonus and earns triple points at supermarkets and double points for gas. There’s a no-fee version of this card too, that’s a solid alternative. Last but not least, the Amex Premier Rewards Gold card is a good alternative for someone who’s willing to spend a little more to get a little more. For the $195 annual fee (waived the first year) you’ll get a 25,000-point bonus, an annual $100 airline fee credit, hotel privileges, plus a variety of travel protections. You’ll also earn points quickly thanks to triple points for airfare and double points at restaurants, gas stations and supermarkets. I never encourage accumulating miles without an objective in mind. Holding on to a large stash of frequent flyer miles for any extended period of time can result in a devaluation of those miles due to changes in rewards programs. The good news is that Delta SkyMiles never expire. With that said, earning a large number of miles in a short period of time for a specific travel goal can be a good decision. Suppose you want to take your significant other on a vacation to Northern South America in Delta Comfort+ class. I found a roundtrip from LAX to Bogota for 42,000 miles per person. Let’s look at how you could get there after just three months. First Month: Apply for the Amex Premier Rewards Gold card and spend $2,000 in the first month to earn 27,000 miles (25,000-mile sign-up bonus plus 2,000 miles for your spending). Second Month: Apply for the Gold Delta SkyMiles Business credit card and spend $1,000 in the first month to earn 31,000 miles (30,000 sign-up bonus plus 1,000 for your spending). Third Month: Apply for the Gold Delta SkyMiles credit card and spend $1,000 in the first month to earn 31,000 miles (30,000 sign-up bonus plus 1,000 for your spending). Transfer the 27,000 Membership Rewards points from your Amex Premier Rewards Gold card to your Delta SkyMiles account. You should now have a total of 89,000 SkyMiles in your account, which is more than what you’ll need to take that trip. While there are other Delta and American Express credit cards that have higher sign-up bonuses, you’ll need to spend a lot more each month than the cards mentioned in this example to earn the bonuses. For example, if you’re willing to spend $450 in annual fees on the Business Platinum card from Amex and you can spend $25,000 on the card in three months, you could earn 100,000 Membership Rewards points. That’s a lot of points, but that’s also a lot of spending. I didn’t include it here because most people won’t be able to meet that spend. 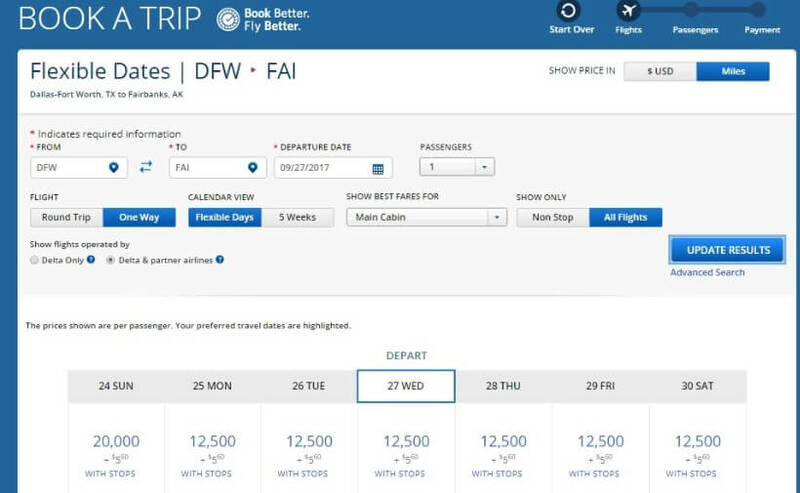 With no published award charts to guide you, finding good Delta redemptions through the SkyMiles program is a hit or miss experience. However, by utilizing the five-week search option, which shows you the price of award tickets for a period of five weeks out, you can find one-way flights for as little as 5,500 miles in some markets. Occasionally Delta even has flash sales where you can pick up a one-way award ticket for as little as 5,000 miles. Although 5,500-mile award tickets are a great find, my favorite Delta SkyMiles redemption is the 12,500-mile one-way awards to Alaska, even in the peak summer months. It can be a challenge to find several award seats together on a flight, but even if you have to purchase one seat and use miles for the others, you’ll still be saving significantly. For more information on making the most of the Delta frequent flyer program, our experts have put together this guide with everything you need to know. Delta Air Lines is a member of the SkyTeam Alliance with 20 partner airlines and additional codeshare relationships with airlines such as Virgin Australia. What this means is that you have many options for redeeming your Delta rewards. 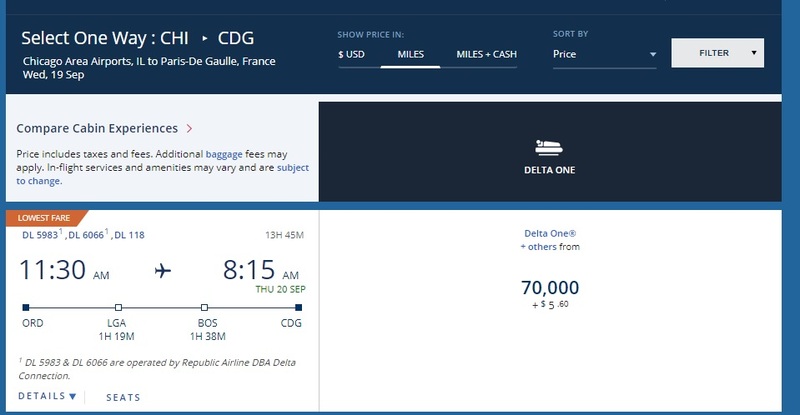 Examples of good redemption values include China Airlines in business class to China from the U.S. or Air France in business class to France from the U.S.
You can search for most partner award tickets on Delta.com. 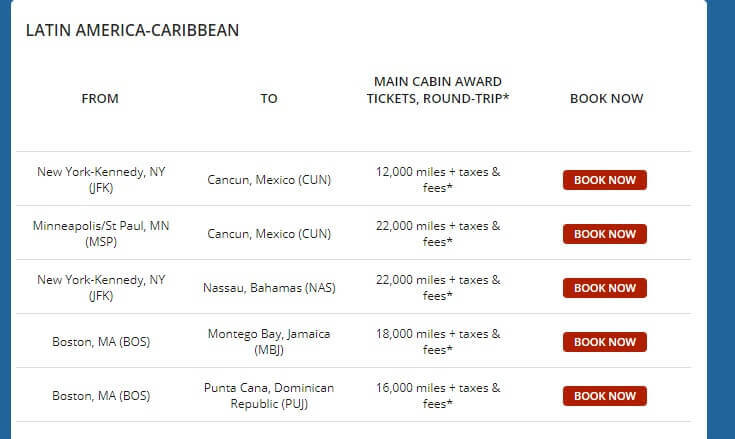 Checking the SkyMiles Deals weekly can also turn up some bargain redemptions, such as the recent deal from JFK to Cancun, Mexico, for 12,000 miles roundtrip in the main cabin. Delta’s Delta One product is a premium business class product that has become very popular with Delta fans as an experiential goal. When you purchase a Delta One ticket you receive Sky Club access plus priority check in, security, baggage handling and boarding. Best of all, Delta One offers flat-bed seating. You can experience this product internationally to Europe for as little as 55,000 miles each way during a flash sale. However, you’re more likely to find it for 70,000 miles each way. You can also experience Delta One domestically coast to coast, typically for 35,000 miles one way. If you fly Delta, having one of the Delta-branded credit cards makes perfect sense as the perks and benefits you receive can far outweigh the annual fees. Pairing a Delta American Express credit card with another Amex card that has partner transfer options can maximize the benefits you receive and add flexible earning and redemption opportunities to your credit card portfolio. It’s a win-win. Whatever card (or cards) you decide to go with, it’s time to start earning Delta miles so you can fly for free. There’s no reason you shouldn’t be taking advantage of these Delta deals.